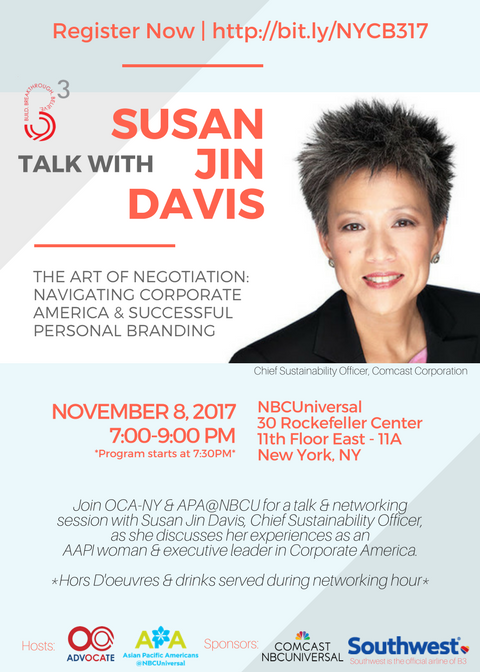 OCA-NY along with the Asian Pacific Americans@NBC Universal are proud to host an evening of dialogue with Susan Jin Davis, Chief Sustainability Officer, Comcast on The Art of Negotiation: Navigating Corporate America & Successful Personal Branding. Please join us for this amazing evening of dialogue and networking! Launched in 2009, B3: Build, Breakthrough & Believe is a professional and leadership development program for aspiring Asian American and Pacific Islander (AAPI) professionals interested in taking their personal and professional goals to the next level through leadership development and networking. The goal of this program is to provide relevant professional development, peer networking and mentoring to aspiring AAPI professionals. Build, Breakthrough, Believe is the three-word mantra of the B3 program and are used as building blocks for the event agenda. Workshops and seminar topics range from personal branding to corporate success tactics and strategies.